Cincinnati, Ohio — Improving educational outcomes for students can be hard work. But sometimes, due to certain legislation and policy barriers, it can be nearly impossible. 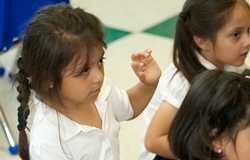 Local Dallas-based organizations were struggling to measure and improve kindergarten readiness rates. With different readiness tests across multiple school districts, there was no apples-to-apples comparison. So the Commit! Partnership, a Dallas-based collective impact initiative, started lobbying at a state-level for SB 172, a state bill focused on reading development and comprehension of public school kindergarten students. After the bill passed in 2013, the state was required to create a common multi-dimensional tool for assess kindergarten readiness. “For the first time, we were that much closer to having some apples-to-apples comparisons for kindergarten readiness in our county,” Commit! Director of Community Engagement Jonathan Feinstein said. Commit! will be sharing its legislative successes with other collective impact partnerships from across the country at the StriveTogether Expert Convening, focused on understanding policy’s role in improving education outcomes for kids. The convening will take place in Phoenix, Ariz., from Feb. 25–26. StriveTogether, which works with communities throughout the country to develop collective impact partnerships to help improve education outcomes for kids, will use stories and insight shared during the convening to develop new tools and resources for the entire Cradle to Career Network. Collective impact has been in the policy spotlight lately on the federal level. Recommendations for the Elementary and Secondary Education Act have called for support and funding to support collective impact work throughout the country. Education policy expert Jesse Moyer, KnowledgeWorks director of state advocacy and research, also will attend the conference to provide national context. Attendees include Commit! Partnership in Dallas, Texas; City Heights Partnership for Children in San Diego, California; StrivePartnership in Cincinnati, Ohio, and Northern Kentucky; Learn to Earn in Dayton, Ohio; and Promise Partnership of Salt Lake County, Utah. Thriving Together in Phoenix, Arizona, is attending in the role of reflector.